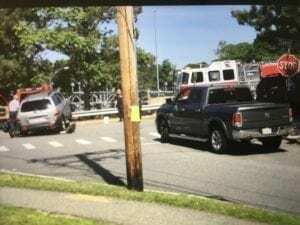 There was another accident at the intersection of Austin Street and Lowell this morning around 9:00. A grey SUV was on Austin Street either going straight or turning right and a maroon van was going straight on Lowell. The van’s front right side hit the SUV’s front left side. Both cars were towed away. No one left in the ambulance. Three fire trucks arrived first, parking on the bridge over the pike, and afterward the police arrived, parking on Lowell, at the scene. The intersection was never closed for any amount of time and a man walking his dog tried to direct traffic for a while but stopped when the police arrived. Then no one directed traffic so the cars just weaved in and out of the accident, police cars, fire trucks and people to keep going on their way – another accident just waiting to happen. This intersection is highly frequented by cars, bikes and pedestrians, including residents walking to Newtonville Center and kids walking to and from schools. I’ve had discussions with residents about which cars have the right of way under different scenerios. But who has the right of way is sometimes irrelevant in terms of who does what because at times the traffic is so backed up drivers are just looking for a tiny space to jump into so they just aren’t watching out for every car, bike or pedestrian. The only way to be safe at this intersection is for drivers to practice defensive driving techniques which is primarily a joke in Massachusetts. There are stop signs on both sides of Austin Street but none on Lowell. It’s a terribly dangerous intersection and will get even more so as the new developments on Austin Street and Washington Street are built. I’m told that a light or stop signs on Lowell aren’t possible because of the intersection’s closeness to the bridge over the pike and the light on Lowell on the other side of the bridge but there has to be an answer that decreases the likelihood of accidents. That is a horrible intersection. When you’re going west, it’s so difficult to see oncoming cars. I avoid going that way at all costs. I don’t really understand why they can’t put a stop sign there because it really could save lives. It’s amazing that nobody left in an ambulance this morning. This intersection is one of many in Newton that, by design or by “just the way it ended up”, is just too wide for its own good. The wideness does a couple of things. First, speeds are too high and variable in a location with limited visibility (coming over the Pike). Second, vehicles can be anywhere in the intersection — traffic and pedestrians aren’t organized as they should be. Third, the sight lines are horrible. Finally, a wide intersection means greater time/distance in the “danger zone”: the potential conflict region where you’re vulnerable to be hit by someone else. Combined with bad visibility, it means high stress and a frequent need for potentially risky behavior. There’s really no reason for the intersection to be much wider than the travel lanes of the roadways. Bumpouts (curb extensions) would move the Austin St. stop lines up, improving visibility and cutting down on the pedestrian crossing distance. There may be some limitations given that MassDOT owns the bridge, but that’s not the biggest issue. The biggest issue is commitment and responsiveness to crashes. The City does not now have a good mechanism to react to crashes (e.g., accident reports don’t flow from the Police to the Transportation or Planning Depts). Crash reports are some of the most valuable planning tools we have. In other cities and towns, a “Vision Zero” process represents a commitment to reacting to crashes and trying to prevent future ones. Thanks, Marti, for letting us know! The main problem I experience going through that intersection is that when you enter from Austin to go either left or right on Lowell, you have to pull too far out to see cars coming from the left…you have to pull out to the center of the intersection, this creates confusion because if you’re coming over the bridge from Washington towards the high school, and want to turn left onto Lowell, you have the right of way but the car is out in the middle of the intersection and you have to make a large circular left turn to get around…or you wave the person on, which confuses other drivers….. It could even be vegetation that is the problem, I’m not sure. Anyways, a lot of the wide curb cuts happened about 10-15 years ago.Because traffic tended to slow down, the city cut the curbs way way back, in a bunch of places, so that cars could maneuver the corners more easily. The most infamous was in Newton Centre, corner of Beacon and Centre Streets. There’s a nice monument on one of the corners. The cutback put the monument right up to the curb, ruinng the placement /aesthetics of the monument and making the intersection completely pedestrian unfriendly. You could barely make it across the street. They have since reversed course and bumped the curbs back out, so it’s more pedestrian friendly. I can set my clock in my office by the honking at the intersection when there’s gridlock. 3:00 pm sharp every day. I agree, the Austin Lowell intersection would likely benefit from pedestrian bump outs. Mistake in my previous comment- if you want to turn left onto Austin, not Lowell…. The width of the intersection is obscene. Mike is right. The crash information should feed into the planning process and this intersection should get attention. But, we shouldn’t have wait until there are crashes to create safe streets. The Roads Program was sold as a program to improve safety for all road users, which requires redesign, especially of intersections. But, so far, the Roads Program has principally been a repave and, maybe, paint program. You don’t need a crash to see that the Lowell/Austin intersection is too wide. (I’ve added two images to Marti’s post.) Lowell and Austin are actually not excessively wide streets. But, the eastern corners, especially the northeastern corner, have such enormous curb radii (the longer the radius, the less tight the turn), the intersection of the two is huge. In the second picture, you can see what it would look like tightened up. Among other things, it would make the crosswalk narrower and bring the stop line up farther, so that the site lines would improve. But, back to my Roads Program point. We should 1. have standards for intersection width, 2. identify the intersections that don’t meet the standards, and 3. narrow the intersections that don’t meet the standards (keeping in mind that there may be exceptions). That’s what it will take to make streets that are safe for all users. Doing anything less is a failure to fulfill the explicit promise of the Roads Program. That’s always been an unsafe intersection. Not sure what can be done to correct it, though. Maybe a right turn only from Austin west to northbound Lowell? It would seem that the reason for the wide turning radius on the NE corner is to allow for trucks serving Star Market. People traveling southbound on Lowell accelerate to come over that bridge and are immediately confronted by a blind intersection. I think a rumble strip on the south side of the bridge might be helpful. Sean, thanks for adding the photos. They help. And thanks for the great information. I think bump outs would help and rumble strips on both sides of Lowell – anything to slow the cars down. Newton like all other cities of Massachusetts is dangerous place to drive, and drivers’ aggressive behaviour is to blame. Almost everyday I encounter a crash in various intersections while driving my kids to activities acrossNewton. One can make all changes to an intersection but if we don’t educate good driving habits these will continue to happen. 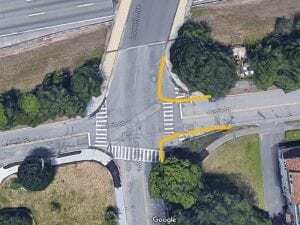 Article mentions that impatient drivers are one reason behind crashes at this intersection, and question is which intervention mentioned will address impatience. Another example is running a red light, and I see cars and bikes running red lights on daily basis, first 5 sec of red light is often ignored. City wide awareness campaigns may have better outcome over long run rather than reactive solutions. Rumble strips and bump outs would help, but they won’t solve the visibility issue, especially those approaching Lowell from Austin street heading west. I think only a turn restriction or a four way stop is realistic. In addition, I still think the reason for the current design of the intersection is to accommodate delivery trucks to the supermarket. I saw someone mention that a Stop sign would not be practical so close to the Washington St signal- but why not? If cars are expecting to have to slow down anyway (at least northbound, with southbound headed towards a light at Otis and NNHS), then a stop would hardly be much of an inconvenience, and surely better than getting into a fender-bender. Ted, a careful design with a mountable curb and a clear and safe pedestrian waiting area might work for larger trucks. These are traffic engineering solutions to these kinds of problems. Our biggest challenge is often just acknowledging the problem and committing to fixing it. For too many things, we’ve been frogs slowly boiled in our own complacency, spiced with dashes of “what about”, “that’s too expensive” and “it will never work”. As negative as that sounds, I am seeing hopeful signs of change recently. This is one of the major routes for kids cycling and walking to Newton North. Also the pitch coming off the bridge is steep so difficult for people in wheelchairs. Curb extensions could help this. There was another accident this morning at this same intersection. Obviously it needs to be made more safe. I”m appalled at how many bike related accidents are taking place in Newton. There seems to be at least one a week. I’m not equipped to say what safety measures would work best in all instances here, but the proposal for Waltham Street looks reasonable and seems certainly warranted. I no longer bike because of age, the condition of so many of our roadways and the way some drivers behave. Some of the bikers I observed are also nothing to write home about, but that doesn’t include all of the bikers that post comments here. It’s clear they know what they are doing and respect the rules of the road. I biked all through Newton and beyond to Mount Monadnock during the early to mid 1950’s. We had it so much better than today’s bikers, but one big difference between then and now was that just about every biker was a kid, and there were a lot of them everywhere. You very seldom saw adults riding any kind of bicycle. By the mid 1950’s almost all adults had some access to an automobile or were taking public transportation. As a result, motorists were more tolerant of bikers because there was a good chance their own kids were in that mix of young bikers on the road. I filed a petition for the Traffic Council, requesting either 4-way STOP signs or full traffic lights at this intersection, which has yet to be heard by the Traffic Council. I’m guessing that most of the two car accidents at that intersection involve a south-bound vehicle on Lowell and a crossing vehicle on Austin. I’ve already suggested a rumble strip on the south side of the bridge to slow those drivers on Lowell. I also noticed a stand of small trees that impede the sightline of west-bound drivers at the Stop sign on Austin. Take those trees out, add a rumble strip on the bridge, and I think the accident rate will be cut substantially. Mike, in my experience more accidents happen there with cars going north on Lowell gaining speed as they see the climb of the bridge coming up rather than cars heading in the opposite direction. They’re not thinking about slowing down at the intersection, it almost seems they don’t even realize the intersection or crosswalk are there. The cars on Lowell going south coming across the pike have just left a light and aren’t sure what to expect on the other side of the bridge and tend to be moving slower, some turning left onto Austin Street as I do, others turning right or going straight. The trees don’t hinder my vision there getting ready to turn. The cars crossing Austin Street or turning left onto Lowell in both directions are all up for grabs – as are the pedestrians. I think the biggest problem is slowing cars down going north on Lowell and giving cars on Austin Street time to pull out from a complete stop as well as time for pedestrians to cross safely.